What got you into tournament fishing? I grew up in a marina business, my parents had a small fish camp and marina business in North Carolina. I loved competition, I’m a very competitive person, grew up being a fishing guide, started being a fishing guide with my dad when I was 11-12 years old right into my teenage years. When I turned 16 I was able to fish the draw tournaments, like the Red Man , BFL, stuff like that. So I got right into tournament fishing and just worked my way up through high school and ended up in pro ranks right out of high school. Qualified my first year on the Bassmaster invitational open to get into the tour and started at 19 years old on the big tour. What I’ve always dreamed of doing and never dreamed of doing anything else. Were you always a bass guy growing up? Yeah I’ve been a bass guy the whole time. You know I like to fish for crappie too and striper, a lot of fish growing up as a teenager, anything that was fun to catch. I still like to fish for anything that puts up a good fight, but bass is what I’ve been a student of my whole life. What would you say is the best part about being a tournament angler? It’s a lot of different things. Probably one of the many things is that it’s never a dull moment, it’s always an exciting adventure, every day is a new adventure, you never know what’s going to change, what’s going to happen, you never have the same thing happen to you. It never gets boring in any way. On the flip side, what are some of the hard parts about being a tournament angler?Probably the hardest part is the travel, the time on the road. Especially for the guys with families that don’t get to travel with them, I’m glad that my wife travels with me and my boys – 9 and 13 – and she’s a teacher so she homeschools them on the road since we started, and since they were able to go to school they’ve been homeschooled. Still, the travel is the hardest part. 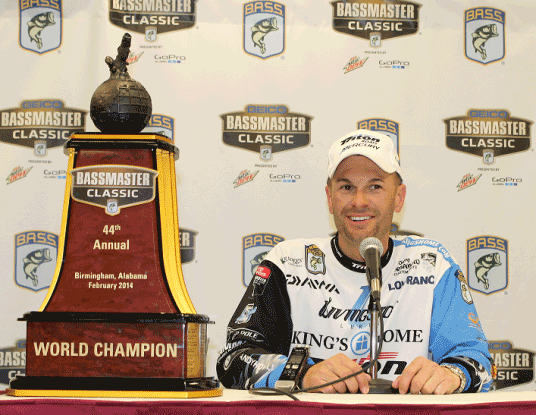 How's it been coping with increased schedule demands since winning the Bassmaster Classic last year? This year (2014) has been…you know, I’ve done this for 21 years or so, built a good reputation, a good bunch of sponsors I’ve been with for a lot of years. So I’ve been busy and as busy as I really thought I could be, and winning the Classic has taken it to a whole other level. The responsibility, accountability and everything. I’ve worked extra hard this year to accommodate everybody’s request as best I can. Is your mindset any different heading into the Classic this year? Is there more pressure being a defending champ? I feel a lot more confidence heading into this year, probably more than I’ve ever had before. As you finally do accomplish a big goal that we all setout to accomplish by winning the Classic. Now that I’ve had one so I can win it, I feel it gives me more confidence, and I feel like I can go back and win it again. Pressure is really a self-induced thing, I try not to do anything to put pressure on myself. Do you now consider your confidence one of your greatest tournament fishing strengths? Confidence in professional bass fishing is probably the biggest ‘It’ factor there is, and it’s something that may, in a lot of guys in our careers of fishing, struggle with. It’s very sketchy from one day to another depending on how good you are doing, or how bad you’re doing. When you spiral and have a bad day, or bad tournament or two, then you got to rely on yourself to come out of that funk, or else you could go downhill and confidence goes down, and you don’t ever want to get on that spiral, and I’ve been there before over the years and I see it happen with a lot of the guys. It’s really key to know I have confidence and learn to be on that even keel where you stay kind of in the middle, where you don’t get too high when you win, you don’t get too low when you lose, and you kind of stay in the middle of the road and you persevere. And that’s another big thing, you’ve got to shake it off and keep moving on. When you find yourself going down in that spiral, what do you have to do as a tournament angler to get yourself back in it? With me, my faith helps me a lot, it makes a big difference in me. As a whole, on average, you got to really know that you’re competing in a sport that has so many uncontrollable variables in it that you can’t beat yourself up and be too hard yourself when things don’t go the way you want them to. We all have talent and ability. When it comes down to winning and losing and persevering and that staying power to stay out there and be competitive for a lot of years, it comes down to what’s between your ears, your mental strength, your ability to block out the negative and try to stay on the positive wavelength. If you had to name three lures you had to use for bass fishing the rest of your life, what would they be? I’m a crankbait guy, number 1 is the Howeller. Yamamoto Senko, such a versatile, classic bait. Have you done much planning or pre-fishing on Lake Hartwell this off season? I went there December 26th, put in five days before the cut off (Jan. 1). Rode up and down the lake to learn about it, did a lot of marking of brush piles and docks. Didn’t fish very much. I don’t like to put too much time. I put in a lot of time last year on Guntersville, because I only lived an hour away, none of that time that I spent there, and all the marks, none of that stuff mattered. I won the tournament because I stayed open-minded and fished to conditions as they changed. If you stay open-minded and not too dialed in on what you think needs to be happening, then you can kind of go with the pattern as it changes, and that’s the key in the Classic. No, missed the Classic in 2008. One of my first times to go there back in December. I really didn’t realize how big the lake is and how big it fishes, it’s going to be a really good lake for spreading out 50 boats. What kinds of things will you be looking for in the practice days before the Classic? Of course watch the weather closely, seeing if we’re on a warming trend or cold trend as that will be a big factor into how I practice and what I’ll be looking for because I think Hartwell sets up as a very versatile lake, and I think you can catch fish really any way. You can catch them from 0 to 50 feet and deeper, and I think there’ll be fish caught in all those depth ranges. A lot of the guys will weigh in good limits of fish. Trying to figure out what patterns are going to sustain and hold up to produce those bigger largemouths is going to be the key to winning and losing. Do you foresee any specific lures that might give you an advantage heading into it? Well I’m a Livingston Lures guy, and we got a lot of new things, like a Jerkmaster 121 jerkbait that’s going to be a really good player if it’s cold, we got a Schoolmaster bait that’s kind of a slow sinking type bait. Howeller Crankbait that I won with last year on Guntersville...if the crankbait bite gets on, the Howeller is going to be a big factor there. Would be quite something to see the Howeller make it two in a row. You got that right. We got the Howeller Plus that came out in November that’s a little bit of a bigger version, has a whole different personality. Runs about the same depth, but it pushes more water, more resistance in the water.